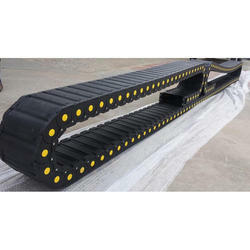 Offering you a complete choice of products which include steel cable drag chains, heavy duty cable drag chains, flexible cable drag chains, cable drag chain, plastometal cable drag chains and cable drag chain metallic enclosed. 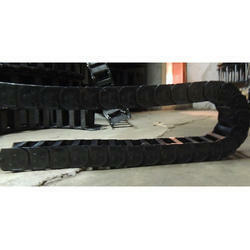 We offer a wide range of optimum quality Steel Cable Drag Chains to our valuable customers. Manufactured in compliance with the international quality standards, the offered chains are widely used to connect various cables to different automated machines such as the foundry, cement and mines. In addition to this, these chains are also known for hassle free installation and minimum maintenance. Owing to the vast experience and knowledge of this domain, we have been able to offer Heavy Duty Cable Drag Chains to our valuable customers. 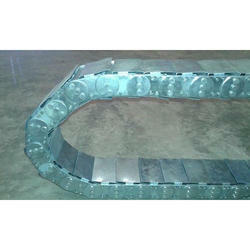 The offered chains are manufactured from fine grade plastic that is procured from well known vendors. Available with us at cost effective market prices, these chains are widely used in many engineering applications to reduce the stress on the cables connected to automatic machines. We are one of the leading manufacturer supplier of wide quality range of Flexible Cable Drag Chains We are engaged in providing quality range to our valuable clients as per industry standard. 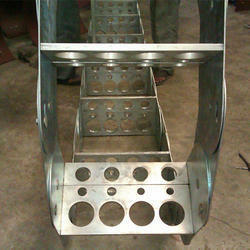 Brand CABLE CARRIER MFG. CO.
We are one of the leading manufacturer and supplier in offering our customers an excellent quality range of Metallic Cable Drag Chains. These products are manufactured from qualitative range of raw materials, which is quality checked by our team of experienced professionals. 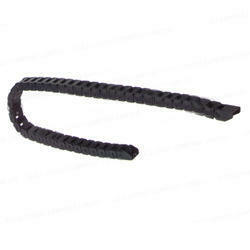 We offer these Metallic Cable Drag Chains at most competitive prices. We are a leading manufacturer and supplier in providing esteemed patrons a premium grade gamut of Cable Drag Chain Metallic Enclosed. These superior quality cable drag chain metallic enclosed are manufactured from excellent quality raw materials which ensure high durability at its user ends. Our spectrum of cable drag chain metallic enclosed are comprehensive finds its valuable application in various industrial sectors. 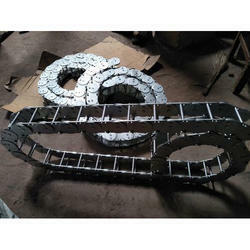 We are offering Stainless Steel Cable Drag Chains used for steel industries, foundries and metal treatments. These products are produced from qualitative gamut of raw materials, which is quality checked by our team of experienced specialist. Available with us at cost effective market prices, the offered products are known for their high resistance to abrasion, self lubrication property and long functional life. It is used for heavy duty applications. 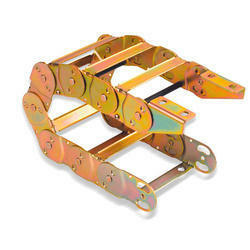 We offer Light Duty Cable Drag Chains both for horizontal and vertical applications. These products are manufactured from high quality metal and alloy. Manufactured in compliance with the international quality standards, these products are used with machines that are involved in the efficient transfer of energy. 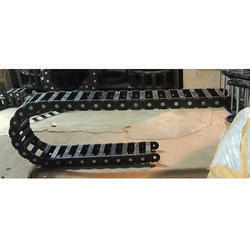 We are one of the leading manufacturer and supplier of Medium Duty Cable Drag Chains used in medium range applications. 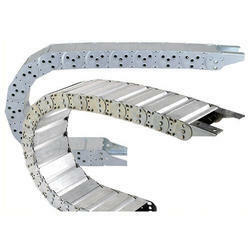 These are used for both horizontal & vertical applications. An important feature of these chains is the ability to carry electricity, gases & fluids simultaneously in any combination to suit the application. 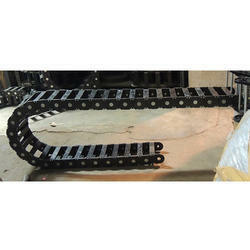 We are offering Enclosed type Engineering Plastic Cable Drag Chains to suit heavy duty applications. A range of cable drag chains provides support & protection for safe conveyance of cables and hoses feeding reciprocating machines. An important feature of these chains is the ability to carry electricity, gases & fluids simultaneously in any combination to suit the application. 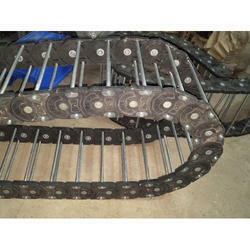 We offering high and fine quality range of Cable Drag Chain Metallic With Round Bar to our most reliable customers which are situated all round the nation. 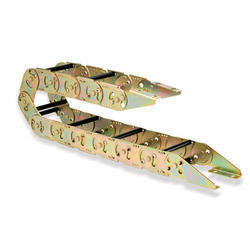 These cable drag chain metallic with round bars are available at market leading prices. We are one of the leading company in providing our patrons an superior quality range of Engineering Plastic Cable Drag Chains. These products are produced from qualitative gamut of raw materials, which is quality checked by our team of experienced specialist. 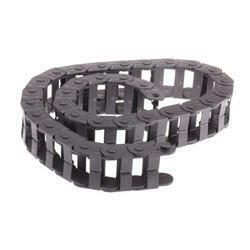 We provide these engineering plastic cable drag chains at most competitive prices.